The baby recently celebrated his very 1st birthday. We’ve been very busy planning a move while working full time, and having the little one’s birthday became another source of stress for me. How were we going to mark the occasion? We don’t really have any parent friends with kids of the same age, so how do we navigate that? Do we invite people without kids and risk their boredom? He’s not really going to remember this one, so isn’t it just for us anyway? I thought back to the pictures and videos of my own first birthday, and there were only a few family members, pictures of me with cake in my face, and time spent playing with new toys. Early eighties birthday party it is then! It was just us, mommy and daddy, my mother, and a close friend who had driven me to the hospital and was there for the birth. We drank champagne while he opened (way too many) presents, and then he got to stuff his face with his first ice cream and cake before a (food coma) nap. It worked out beautifully. 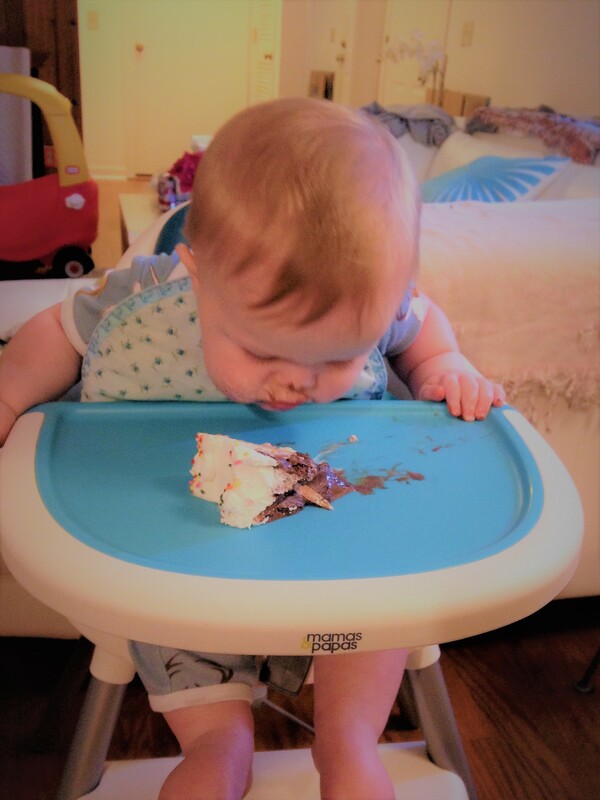 All the stress is totally unnecessary to place on yourself, especially for a first birthday, and we have the most adorable little video of him foregoing his hands to directly faceplant his mouth onto the cake. With every birthday comes a bit of reflection, so I wanted to look back on all that we have accomplished with him during his first year. List post commences here! This goes out to both of us. With the number of complications, this one was a big deal. We were both physiologically trying to kill one another, so having the birth itself be so uncomplicated was quite a feat. This was an emotional rollercoaster that I cannot compare to anything I have ever experienced. Not being able to take him home immediately, having to do modified versions of care, and generally feeling helpless are only a few of the things you have to grapple with, but we made it through the experience! I had no idea what to expect from such a drastic alteration to my life, and I’m still trying to work this one out. I know that it has changed my sense of responsibility, my work ethic (especially having to go back to work after 3 months), how I spend my days and nights, and the balance of what is important in my life. You know, the little things. We have traveled 17 states in the US with the little guy by car and by plane. He has stepped his feet into both the Pacific and Atlantic Oceans as well as the Gulf of Mexico. He has been to my home town of Las Vegas (yes, I am actually from there) and has visited his 96-year-old great grandmother in Colorado. How cool is that? What a lot of fun weaning has been! One of my biggest concerns was having a picky eater. I know I’m not out of the woods yet, but this baby seems to like vegetables more than anything else. He particularly likes broccoli, cauliflower, Brussels sprouts, green beans, and butternut squash. I’m hoping this results in fewer demands for crappy food, but only time will tell. Crawling, standing, and watching him discover and manipulate things has been amazing. We have been so fortunate with his easy-going disposition, and I look forward to continuing to see him grow and experience the world. Sleeping through the night took a good ten months to get under control, but we got there! So many sleepless nights, so many all-nighters, so much play at 3 am. I’m very luckily to have a job with a flexible schedule. So adorable. When thinking about the things I would miss about the baby times, the little baby sounds top the list. We have tried to capture as many as possible, but I know these little first expressions of language are the ones that will touch me the most when I look back at this time. He has said “mama” and “dada” many times without necessarily knowing what he says, but I’m sure he’s beginning to understand now. Given that a lot of my first words were things like AT&T and other brands I saw on TV, I think we’re doing a bit better. I have spent a lot of time thinking and acting on what is most important to me in thinking about a parenting style. I have decided on a few things that are really contingent upon our lifestyle and how they actually work, but they are based on a few basic principles. I care most about travel, science, happiness, and nutrition, so all of my parenting philosophy revolves around these four things. Something that is often touted but not well described is the love that you feel for your children and how that makes you a less selfish person where your children are concerned. As a neurobiologist myself, I could attempt to tell you all the reasons why this happens, but I would not be able to explain to my child-free friends why this change is so profound. I could tell them that as a mother, that you can be pretty helpless to the powers of your own hormones, but the extent of that is pretty hard to convey. The first birthday is an amazing milestone. There had been such undo pressure on mothers to make everything perfect, but really, this birthday is for you, Moms. You made it this far, and that is what matters most. Don’t overwhelm yourself with plans that take away from your own accomplishments. Baby’s first birthday should really be an extension of Mother’s Day. I think we all deserve champagne brunch! I’ve definitely also spent more days in sweatpants than I care to admit! sounds like a great way to spend the big numero uno!